Josh Moreman opens the scoring for Peterborough Sports against Desborough. Photo: David Lowndes. But Dean was more satisfied yesterday (Faberuary 25) as table-topping Sports eased past third-placed Desborough Town 2-0 at PSL. An early goal from Josh Moreman and a second-half strike from fit-again forward Mark Jones sealed the points and maintained a 12-point advantage over the rest. Action from Peterborough Sports' 2-0 win over Desborough (red). Photo: David Lowndes. Second-placed Deeping Rangers, presuming they don’t believe they can catch Sports, also enjoyed a decent day. 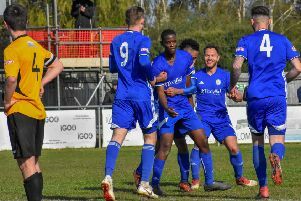 They are now seven points clear in second after their own 4-2 win at Wellingborough Town and a shock 2-0 defeat for Eynesbury Rovers at Holbeach United. Captain David Burton-Jones, one-time Posh player Charlie Coulson, Tom Waumsley and Scott Mooney were the Deeping scorers. Charley Sanders, on his debut following a transfer from Yaxley, and Jake Clitheroe scored for Holbeach. Yaxley are up to third after a 3-1 win at Northampton ON Chenecks. Sam Spencer, Phil Stebbing and James Hill-Seekings (his first goal for the club) were the men on target for the Cuckoos. Peterborough Sports striker Mark Jones (10) can't quite force the ball past the Desborough 'keeper in the United Counties Premier Division clash at PSL. Photo: David Lowndes. Wisbech Town shrugged off the loss of teenage talent Harry Limb to Premier League side Burnley earlier in the week to thrash Cogenhoe 5-0 at Fenland Park. Alex Beck scored twice for the seventh-placed side. Jake Mason was another debut scorer as Peterborough Northern Star drew 1-1 at Rothwell Corinthians. Mason moved up a division from Bourne earlier this week and supplied a fine finish just before the hour mark following a lovely through ball from Sam Wilson. Jake Mason (stripes) in action on his goal-scoring debut for Peterborough Northern Star at Rothwell. Photo: Tim Gates. But 12 minutes from time an unfortunate own goal from Matt Cox gave the home side their equaliser. Blackstones manager Andy Lodge threatened to rip up his Division One squad last weekend and if it was a motivational tactic it worked as goals from former Posh defender Gareth Jelleyman and Josh Russell secured a 2-0 win at Thrapston. Bourne led high-flying Olney Town 2-1 midway through the second half before succumbing 3-2. Jack Bottreill and Jake Humphries scored for Bourne who are now two points and a place behind Stones in 15th. It was another good day for play-off chasing Spalding United in Division One South of the Evo Stik Northern League. Matt Cox (stripes|) in action for Peterborough Northern Star at Rothwell. Photo: Tim Gates. Goals from Leon Mettam, Brad Wells and Conor Higginson strengthened the Tulips’ grip on second place as Sheffield FC were beaten 3-0 at the Sir Halley Stewart Field. Stamford AFC also picked up three points as Grant Ryan and Danny Draper scored in a 2-1 win at Chasetown. Spalding Utd 3 (Mettam, Wells, Higginson), Sheffield FC 0. Wisbech Town 5 (Beck 2, Smith, Vince, Adams), Cogenhoe United 0. Thrapston Town 0, Blackstones 2 (Russell, Jelleyman). Wisbech St Mary 1, Framlingham Town 3.